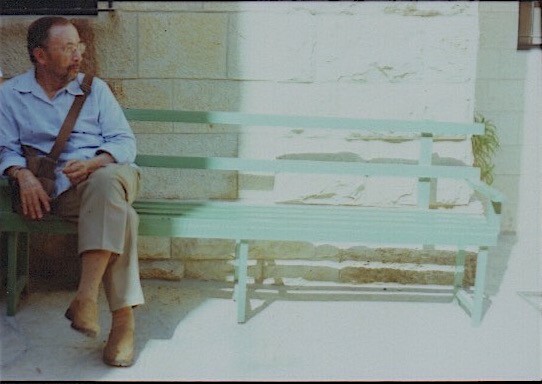 Years after poverty pried my 45-year-old, 35mm Minolta out of cash-strapped hands, I brought the camera out of retirement for a trip to Israel-Palestine in September. 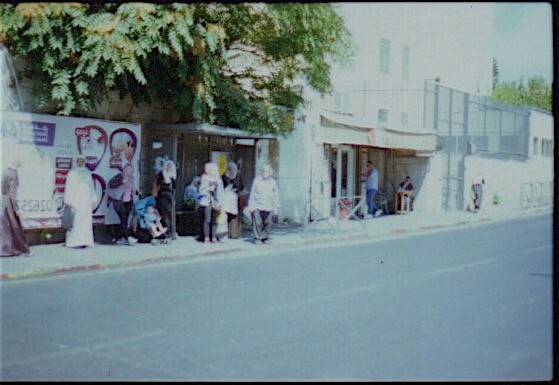 In Tel Aviv, I embarked on a quest to find film, which took me on a walk over a busy highway, past the train station, through a construction site, into a decrepit building on a back street, up a dim, dirty staircase, and behind a red door into an air-conditioned, crowded photography shop where they take those Awkward Family Photos from the 80s. Inside, I pointed confidently towards a Fujifilm 100 ISO daylight 35mm stock and prepared to reignite the passion of my shutter finger. The voice of my high school photography teacher echoed through my head: When I spool it like this (Claws clinging on the edge of the frame)… and I close it like that (Trap the light, glide the claws, and don’t push but squeeeeeze). In the words of the immortal Celine: It was gone with the wind, but it’s all coming back to me now. 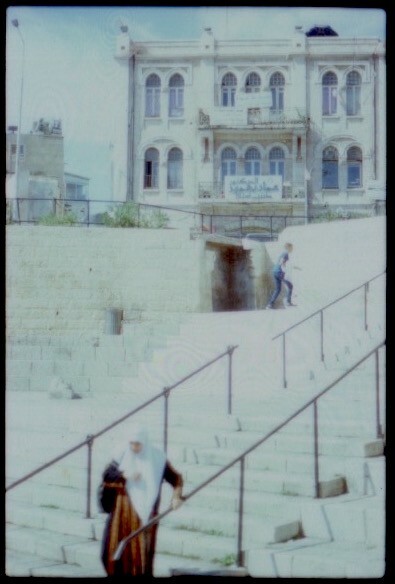 I didn’t have a battery for my light meter and simply guessed on the shutter speed and F-stops for the first 15 photos on the roll (until tracking down a battery in Nazareth). My preference is usually to stop down once past proper exposure and make things ever so slightly dark. Turns out, all the sunshine weighted my darkness-barometer way too heavily. 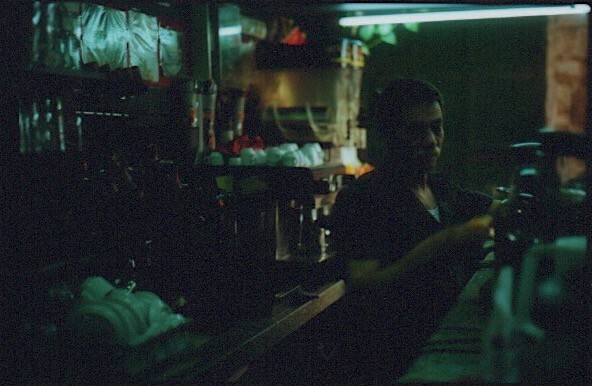 But it wasn’t until I returned to Berlin and proudly presented my roll of real-deal 35mm to the photo processor that I realized my real mistake: color reversal slide film. 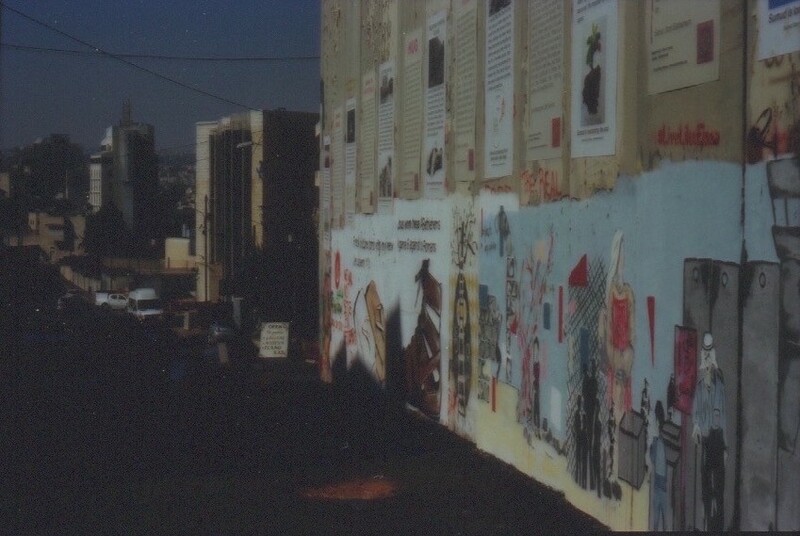 Instead of negatives, I had taken a whole role of slides that would require a Carousel projector to review, and would naturally make much darker prints than negative film. Yes, my photos will all be masked in darkness, I acknowledged. I wanted to go back to the past with tactile, 20th century film, but not that far into the past!! So, with processed slides, a little work to transform my printer into a scanner, and an infantile knowledge of digital photo re-touching, I present an anachronistic marriage of analog and digital photo development illustrating my limited perspective, captured only by the small box of one photo frame. “To get to the past, you always have to go down,” says our guide, Ayad. And as we walk to the Damascus Gate, into the Old City of Jerusalem, the layers of the past begin to reveal themselves. Stone on top of stone, covered and then reasserted, nearly 3,000 years of the past whisper out their memories. Or maybe it’s just the softness that makes everything look old. As a corollary: that means building up is building into the future. What comes later, comes higher. Are these layers on top of layers like the Tower of Babel, attempting to stretch towards heaven? Do they dominate and crush history, or improve upon the past and move us toward the eventual, inevitable drive to perfection? Early in the morning, while Orthodox Jews call out to God at the Western Wall, the remaining access to the mostly-destroyed Second Temple, right-wing Israeli activists queue up to enter the holiest site in Islam, on a hill directly above the Western Wall. 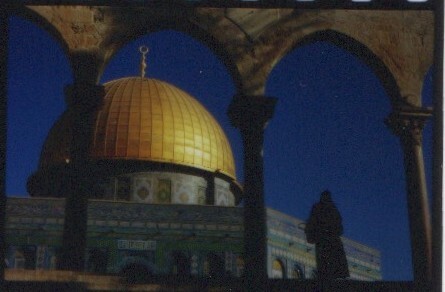 It is from here that Muslims believe their prophet Mohammed made his night journey to heaven. And did I mention that it’s just atop the holiest site in Judaism? Jewish activists come to assert their rights and stake their claim. They are allowed to come (and asked to go) before tourists and Muslim worshippers, so that by segregation this combustible thin-space ripe with meanings will not explode. Speaking of spaces about to explode: the “Israeli protection barrier fence” (which looks a whole lot like a wall), in Bethlehem. This was my own personal wailing wall. For more info, and a much better photo taken with the camera on my mobile phone, see earlier post. This man makes excellent Arabic coffee. He is also good at telling it like it is. 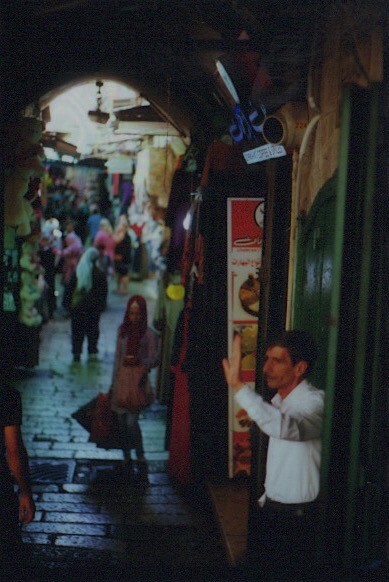 In spite of conversations like this, I was treated with nothing but respect in all quarters of the Old City. In East Jerusalem, most women do cover. Yet I was not made to feel any oppressive shame or discomfort for not covering my head everywhere. (I did cover my head in the Old City, and in the churches.) I spent a lot of time reflecting on whether this was tourism privilege, or if an inherent tolerance does exist in the culture, even if it’s not recognized. While most of the women in my group felt the “oppression of the Muslim culture toward women,” I found myself comparing the experience to Bangladesh and feeling rather liberated. Why? There is something safe about not being the only one. And while you can walk the streets of Dhaka and literally be the only foreigner, you can’t walk the streets of Jerusalem in the same way. Israelis and Arabs dress differently. Christians and Muslims and Jews dress differently. There is an inherent pluralism in everyday life that would still be there if it weren’t for tourists. That made me feel safe. That said, nothing makes me think about my white privilege more than being in these situations where I am most clearly The Other. In so much of my daily life, I don’t even have to consider my Otherness because I am a socially-privileged majority. Even in Berlin, where I am a foreigner, I can hide in plain sight. As long as I don’t open my mouth, I may not appear to be an outsider. It gives me an easiness that I can’t see, until I am forced to confront the heaviness of not having it, which the majority of humans (who come from groups that — let’s face it — white privilege lets us call “minorities”) have to live with every day. The wooden cross is called the “Jerusalem cross,” and it is a design that dates back to the Byzantine era, when the way of Christ became imperial Christendom. 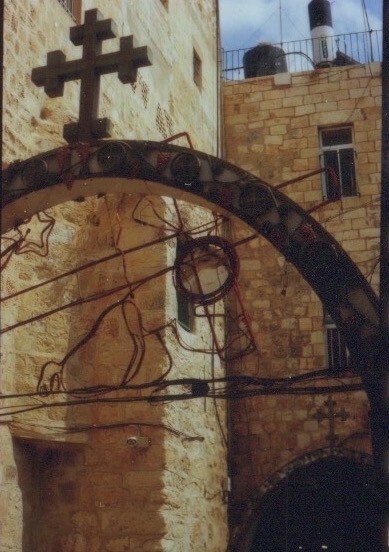 The Crusaders are responsible for a huge number of the memorial churches, or what I would call, the capture and codification of Christian space into Disney-esque ritualization, in Israel-Palestine. 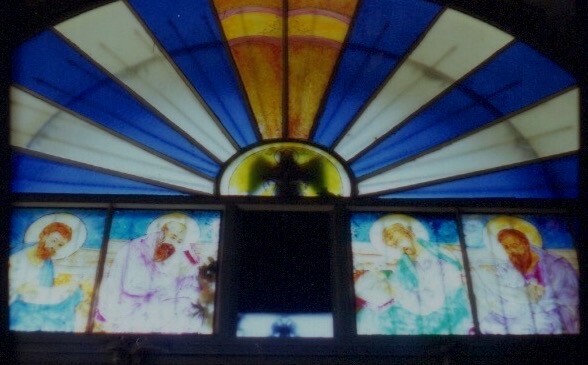 To follow that up, this is the only photograph that I took inside a church. I mostly took it because I love stained glass and it looks a little like the bat symbol. What Israel-Palestine makes clear is exactly what Christianity inherits from Judaism: a legacy of representation. When the nomadic Hebrews of the Old Testament wanted to mark a place where God did something, they built an altar. And in Judaism, physical spaces (the Temple, the Ark of the Covenant, the Holy Land) are all hugely important to the very notion of worship. Similarly, in Islam, pointing in the direction of Mecca is as important as the prayers themselves. The Hajj, or pilgrimage to Mecca, is one of Islam’s five pillars, meaning the physical journey is actually a sacred duty for anyone who has the means to undertake it. The physical space in which “Holiness Occurred” is paramount in both religions. I don’t believe this is actually true in Christian belief. That is what was so uncomfortable about going to the Church of the Holy Sepulcher and being asked if I would like to “venerate the stone upon which Christ was crucified,” or, in the Church of the Nativity, if I would “touch the place where Christ was believed to have been born.” From Constantine’s mother, Queen Helena, who invented the “put a bird on it!” of the Byzantine era (think: “build a church on it!”) to the conquests and re-assertion of the Crusaders, whose church-building was more a statement of ownership than of worship, this intense desire to codify and contain sacred space seems antithetical to the message of Christ. Jesus proclaims that God’s love cuts through ritual, across borders and ethnicities, and expands sacred space into all of our common spaces. No need to wrap it in a bow or consolidate it into a statue. Wordy and worldly. Filmmaker and freelance writer covering culture, philosophy, travel, urbanization and theology. Based in Berlin.